The following article by Rabbi Raymond Apple appeared in the Journal of the Australian Jewish Historical Society in June 2017, Vol. XXIII, Part 2. The British chief rabbinate grew out of the office of rabbi of the London Great Synagogue in Dukes Place. Not that any congregation – even Dukes Place itself – consciously decided on or endorsed the appointment of a particular rabbinic incumbent to an overall ecclesiastical role for British Jewry as a whole, but a series of events produced this result. For a long period, the New Synagogue in Great St Helens was without a rabbi, mostly for financial reasons, so that by default, Solomon Hirschell, rabbi of the Great Synagogue from 1802-1842, came to exercise jurisdiction over the whole community. Jews and gentiles both became accustomed to calling him the High Priest of the Jews, creating an entrenched fact with the result that after Hirschell’s death in 1842 a range of congregations united to find (and fund) a “chief rabbi”, an innovation that fitted into the Victorian British liking for system and structure. In 1844, the group of congregations elected Nathan Marcus Adler of Hanover to this office. Adler was elected largely because of the support of the Duke of Cambridge, who knew him from Hanover. The first British chief rabbi with a university education, Adler was an experienced ecclesiastical administrator, determined that his writ would run throughout the proud British Empire, even though Judaism – at least since late antiquity – had hitherto not known of rabbis exercising jurisdiction over others. Apart from Adler, the other clergy – even the few with rabbinical learning – were known by the British nomenclature of “The Reverend”, deferring to a chief rabbi who was the Jewish equivalent of the Archbishop of Canterbury. The fact that the Jewish ecclesiastical chief was the only acknowledged rabbi resulted in critics dubbing Adler a “Chief without Indians” and mocking what they called “Adlerism”. Not that the Chief was without his challengers. Apart from the nonconformist views represented by Rev (later Professor) David W Marks, founding minister of the newly established Reform synagogue, Adler was confronted by the ambitions of two rabbinic rivals – Herman Hoelzel, chazan of the Hambro’ Synagogue and subsequently minister in Hobart and Sydney, and Solomon Schiller-Szinessy of Manchester and then Cambridge, whose affiliations moved from orthodoxy to reform. Both Schiller and Hoelzel were colourful and significant figures. The current paper focusses on the ambitions and activities of Hoelzel because of his part in Australian Jewish history. Hoelzel’s background is not entirely clear. He claimed a continental doctorate which might not have been genuine. He held the title of Morenu (“Our Teacher”) bestowed on him by various European rabbis and endorsed by Rabbi Moses Sofer of Pressburg. This was not necessarily rabbinic ordination, though it indicates orthodoxy and learning. Born in Altofen (Budapest) in 1812, Hoelzel had a good voice and was Reader (chazan) in Magdeburg, Germany, from 1836-40, before gaining a similar appointment in Hanover, where Nathan Marcus Adler was rabbi. He moved to England in the 1840s and served the Hambro’ Synagogue as Reader and occasional preacher from 1845-52. His first sermon was in October 1850, when the Jewish Chronicle asked the community to be patient with the preacher’s inadequate English diction. Like Samuel Marcus Gollancz, his successor from 1855-1900, Hoelzel was nominally Reader but he carried out broader functions. There was not yet a clear distinction between chazan and minister: this came later. Hoelzel’s sermons at the Hambro’ were apparently dramatic, argumentative and controversial. He urged Jews to band together to achieve restoration in the Land of Israel, a thought which some regarded as hindering the movement for political emancipation. Hoelzel was more outgoing than Gollancz, who was a quieter type who concentrated on his local ministrations whilst holding high hopes for his son Hermann. Few of the other Jewish clergy had their level of learning and orthodoxy. Hoelzel was presumably on good terms with Adler, whose appointment as chief rabbi, just before Hoelzel came to London, was bound to cramp Hoelzel’s own expectations. In Hanover, Adler had examined him in Hebrew and rabbinic knowledge: from 1843 the State had required all Jewish religious officials to be approved by the Landrabbiner. Adler’s confirmation that Hoelzel was competent to be a minister, not just a cantor, might have assisted Hoelzel but it spelled trouble for Adler. The chief rabbi’s intention to be the ultimate authority for all the Jews of British countries was clear from the beginning, but Hoelzel harboured the ambition (presumably not revealed to Adler) of holding an equivalent position in the Antipodes. Aware that Sydney and Hobart were interested in Hoelzel as minister, Adler recommended him with the important proviso that any major decisions were to be referred to London. Nonetheless Hoelzel represented himself (probably on his own initiative) as authorised by Adler to act on a higher and more independent rabbinic level. On arrival in Australia, Hoelzel informed his congregants that Adler had appointed him as presiding rabbi of the Australian colonies, whatever the grandiloquent title meant. He certainly had a high opinion of himself. Adler had recognised that the Hambro’, despite its communal cachet, could not contain Hoelzel, but probably neither Australia nor Adler himself realised the extent of Hoelzel’s pretensions. With wisdom after the event, we have to interpret Hoelzel as planning to bypass the chief rabbi and be the Adler of Australia. Hoelzel was Yechi’el ben Yehudah, the son of Rabbi Judah Semnitz, “second rabbi” (presumably dayyan) of Altofen (Buda) in Hungary. Semnitz is from the Hungarian town of Szenice. Herman used the name Hoelzel, though we do not know why. Holz means “timber”. Hals is a chicken’s neck. Hoelzel had a strong personality, musical voice and Jewish knowledge. He had a foreign accent in English, which may have worried the Australian synagogue committee, concerned to prove their respectability. He was not the only applicant for the vacant ministerial position in Sydney, but he seemed the best qualified. However, precious time was lost when the London committee charged with dealing with applications had misgivings which needed to be cleared with Sydney. The problem was that the selection committee had doubts about the extent of his secular knowledge. The strange thing is that Hoelzel’s lectures in Australia exhibited a considerable degree of knowledge, especially of music and astronomy. The London committee felt that any decision should be made in Sydney. It took months for letters to go between England and Australia. Sydney eventually decided in 1852 to appoint Hoelzel, but in the meantime neither Hoelzel nor Adler thought anything would happen with the Sydney position, so Adler sanctioned Hoelzel’s appointment to Hobart instead. When a letter from Sydney eventually reached London, Hoelzel had already left for Hobart, so Sydney missed out, at least at that stage, on securing Hoelzel’s services. He did later become minister at York Street, not that this shidduch turned out to be a great success, but at this point they were upstaged by Hobart. It appears that the first that Sydney heard of the new situation was when they received a communication from Hobart saying they had engaged Hoelzel. On 22 May 1853, the new minister reached Tasmania on the Abberton with his wife Mina, who was the daughter of the rabbi of Yarmut. Mina was probably from the Hungarian town of Ballasyarmat (or Yarmit or Yarmut), which had a large community and yeshivah. The Hoelzels were childless. Hoelzel immediately declared himself presiding rabbi of the Australian Colonies and a “private source” quoted by the Jewish Chronicle said that Hoelzel was “expected to be recognised as the Presiding Rabbi of the Australian Colonies by the congregation of Sydney”. This suggests that someone was privy to Hoelzel’s thinking, but Sydney resented the way it felt it had been treated and declined to accept Hoelzel’s jurisdiction, declaring its intention of appointing its own rabbi. It rankled that Hobart asserted that Hoelzel’s title had seemingly been approved by London. A protest was sent to Adler, who made no comment on Hoelzel’s title but said that because of the delays, Hoelzel (and he) had felt that no Sydney appointment was likely to eventuate, so he had nominated Hoelzel for Hobart. …the Rev Dr NM Adler, Chief Rabbi of the Jews of the British Empire, has been pleased to nominate and appoint the Rev Herman Hoelzel who has recently arrived in this city to be the Presiding Rabbi in the Australian Colonies with full power and authority to adjudicate in all religious matters. Hobart wanted to be the major Australian congregation and it suited them to swallow whatever Hoelzel told them. The Jewish Chronicle reported on 11 February 1853, on his “energy and perseverance”. On 22 June, the Melbourne Argus reported his induction. The ceremony on 5 June was conducted by the second Reader, Henry Jones, with a choir and orchestra. The congregation rose as Hoelzel was led to his seat under a velvet canopy. A collection amounted to an impressive £150. Hoelzel’s sermon commended religion as a means to wisdom. Prayers were said for the Queen, the Prince Consort, the Lieutenant-Governor and the Colony in general. Jones was a former pupil of Rabbi Aaron Levy of the London Beth Din. He later went to Christchurch, New Zealand. Hoelzel set up a Beth Din in conjunction with Jones, and on 29 January 1854, conducted the divorce of Michael and Sarah Solomon(s); the husband was in gaol for stealing from his mother-in-law. Hoelzel visited Launceston in late 1854, and the Tasmanian Colonist of 6 November acknowledged his impact on that city. Apart from rabbinical and cantorial skills, he must have known shechitah since he trained Henry Lewis Harris of Hobart to be a shochet in Melbourne. It is possible that Hoelzel was defying Adler by giving Harris kabbalah, rabbinic authorisation to perform shechitah. Hoelzel was a competent preacher, usually speaking ex tempore. He was certainly cultured, even though the committee in London had doubted his competency in secular subjects. He made contact with the Royal Society in Hobart and gave lectures to the general public. He was the most significant, most highly qualified minister the Hobart community ever had, but his incumbency lasted only three years. Hobart Jewry never again had a man of such stature. By 1856 Hoelzel fell out with Hobart, partly on financial matters. Once more he approached Sydney. This time he secured an appointment there. The board’s annual report said that his “recent arrival amongst us has been hailed with pleasure” and hoped that “he will render this congregation a pattern to all others”. This time they did not oppose his claim to be Presiding Rabbi of the Australian Colonies, since the grand title brought them status in the eyes of the gentiles. However, the Melbourne Hebrew Congregation objected to his pretensions and opposed his conducting conversions and divorces without consulting or deferring to Adler, who by now must have realised Hoelzel’s perfidy. In Sydney, as in Hobart, Hoelzel gave public lectures on music and literature. His lecture, “The History and Use of Music”, given at the School of Arts on 25 August 1857, was interspersed with musical illustrations (the Press remarked on Hoelzel’s “sweet voice”), and C Packer gave an organ recital. The address was widely reported and printed in pamphlet form together with Hoelzel’s own piano compositions. The Jews were understandably proud of their rabbi. Then matters took a more problematic turn. There were conflicts on liturgical and financial matters (Hoelzel sought a salary of £500 a year), but the real crisis came when the board found, to its alarm, that the rabbi and his wife had shown support for the maverick artist, Samuel Elyard, who claimed to be king of Australia, prince of Israel, and Elijah incarnate. The Elyard story is not reported in the York Street Minutes, which refer only to “certain circumstances”. The connection with Elyard was traced by Dr George Bergman when he was writing an article for the Australian Jewish News. Bergman found the details of Hoelzel’s departure from Sydney in papers about Elyard held at the Dixson Library in Sydney. Elyard (1817-1910) was a son of the surgeon on the John Bull convict transport. By 1837 he was a clerk in the Colonial Secretary’s Department. A brother was chief clerk of the Supreme Court; another was Under-Secretary of the Colonial Office. Samuel Elyard had mental problems and was a religious maniac. He particularly interested himself in the Jews of Sydney (especially the females) and secured Jewish signatures to his manifestos including one acclaiming “Her Majesty Phoebe Frances, Princess of Judea”. Phoebe Frances may have been his own daughter. Hoelzel and his wife were taken in, though they did not acknowledge Elyard as a prophet of Jesus. Bergman’s theory is that they did not fully believe Elyard but felt that Jews should show respect to a family that held positions in government. My own theory is different. Elyard’s lecture at the Sydney School of Arts on 23 April 1859, titled “Flowers of the Jewish Writers”, uses a jumble of Hebrew words and Jewish references, which leads me to think he may have received Hebrew instruction from Hoelzel. Elyard even sought a synagogue seat and wanted to preach at York Street. Though he wanted to turn the Jews into Christians, he was denied the pulpit of St Andrew’s Cathedral. Elyard eventually became a significant artist and photographer and lived until 1910. The synagogue board regarded Elyard as dangerous, and was perturbed at Hoelzel’s dealings with him. The Hoelzels changed their minds, but the damage was done. The board told the rabbi that if he resigned his post they would pay his and his wife’s fares back to England and give him six months’ salary. When Rev Moses Rintel left the Melbourne Hebrew Congregation, a Melbourne lay leader, Edward Cohen, had ideas of Hoelzel succeeding Rintel. Hoelzel was interested and agreed to repay Sydney most of the fare money to Europe. However, for financial reasons Melbourne made no ministerial appointment at this stage, and the Hoelzels left Australia on the Victoria on 11 May 1858. They told people they were returning to England, but Hoelzel does not figure in the subsequent history of the British rabbinate and we do not know what happened to him. Presumably Adler breathed a sigh of relief once a (possibly unexpected) challenge to his own imperialist ecclesiastical policy was over. Hoelzel might have made for England in the first instance, but it is likely that he went – perhaps soon afterwards – to the Continent, where someone of his name died in Vienna in February 1886, aged 74, having embarked on a business career. Whether this was our Herman Hoelzel is not definite, but the dates fit. If it was he, we do not know whether he functioned anywhere as a cantor or rabbi. He does not seem to have reverted to the patronymic of Semnitz. Apart from Bergman’s article, the only study of Hoelzel is a paper by Rabbi Israel Porush published in the Australian Jewish Historical Society Journal, volume 2, part 4 (1945). Rabbi Porush had the advantage of using the file of Hoelzel’s two applications to the York Street Synagogue in the 1850s. This file is no longer at the Great Synagogue. There may be relevant correspondence in the Elkan Adler collection at the Jewish Theological Seminary of America, but I worked on this collection in 1970 and do not recall any such material. There will always be a mystery about Hoelzel’s disappearance from Anglo-Jewish and rabbinic history. Why did the man not return to Britain or at least seek a major rabbinic pulpit somewhere on the Continent? The answer to the first question seems clear. Having tried and failed to become the Adler of Australia, he could not come back to a subordinate position under the real Adler in Britain: Adler would have blocked it. How about a position on the Continent? Here too the British chief rabbi was to be reckoned with. The Adlers had a strong family network and the chief rabbi would probably have stopped his former challenger from holding a significant pulpit or even a cantorial position. So Hoelzel was stuck, and, presumably with the agreement of his wife, decided to enter the field of commerce. Whether he prospered we do not yet know, but we can only surmise. Can we contrast Hoelzel and Solomon Schiller-Szinessy in Manchester, who also tried to rival Adler? How Schiller-Szinessy made a fool of himself is another story, but it turned out to the advantage of Adler when the Manchester power-play dissipated. Unlike Hoelzel, Schiller had real academic and rabbinic qualifications. He was a scholar, writer and speaker who was a real challenge to Adler. It helped him to have been a revolutionary who was captured, wounded and escaped. Had he stayed on as “Local” (namely communal) rabbi in Manchester, it would have been hard for Adler to rein him in but Schiller did Adler (and himself) a favour. In 1863, he went into academia as Reader in Talmudic Literature at Cambridge University, for which he was well qualified. Adler’s authority was saved. Adler decided to safeguard his and his family’s status by sending his son Hermann to Leipzig University and to Rabbi SJ Rapaport in Prague, in order to attain qualifications which would rival those of Hoelzel and Schiller. Whether Hermann reached his father’s level of learning is a matter of debate, but by getting his son a Continental education, the father had saved the Adler dynasty. Now, at least until the twentieth century, there was no real challenge to the Adlers. Since Hoelzel’s time there have been a number of high-profile Australian rabbis, who, by convention, have been regarded as tantamount to national chief rabbis. From time to time there has been friction between these men as to who was the more senior. There have been sporadic but unsuccessful attempts to create a formal Australian chief rabbinate. There are orthodox and reform rabbinic associations with elected presidents, who are thus in a sense presiding rabbis, though without the éclat of an Adler or even a Hoelzel. What would have happened had Hoelzel stayed in Australia and succeeded in establishing a local hegemony, is a question without an answer. Until 50 years ago the British chief rabbi retained the formal allegiance of most Australian congregations. Most local orthodox synagogues still treat the London incumbent with deference, but the notion that the latter is chief rabbi of the Commonwealth has no legal basis. In the Australian rabbinate, the formal title of presiding or chief rabbi does not exist: probably a good thing in a heterogeneous community. By way of postscript let me come back to Samuel Elyard. There is no denying that the mixed-up artist had some acquaintance with the Zohar, the book of the medieval Jewish mystics, though probably not in the original Aramaic or Hebrew. He says in his rather jumbled lecture, “Flowers of the Jewish Writers”, that for want of Hebrew type he was unable to reproduce passages from Jewish literature in their original language. As I have suggested, such Hebrew as he knew might have been taught him by Hoelzel, who was foolish enough to get involved in Elyard’s schemes with their argument that Christianity was superior to Judaism and that it was ridiculous of the Jews to fail to recognise the Messiah. After Hoelzel’s departure, Elyard continued to dabble in a strange combination of Jewish and Christian theology. As late as 1897 he published a series of Letters to a Jewess in which (though I have not seen the actual text) he is said to have once again urged the Jews to accept Christianity. At some stage, however, his mental state apparently settled down and he produced significant artistic work, concentrating particularly on landscapes, especially of the Shoalhaven district. As time went on, not only his paintings, but his photography won acclaim. No-one ever took his theology too seriously. He probably knew that because of him the “Presiding Rabbi of the Australian Colonies” came undone. Whether this gave him any joy we cannot be certain. I am grateful for the assistance of the Australian Jewish Historical Society, especially Joe Kensell. Some of the material on Hoelzel which was formerly located at the Great Synagogue is now held by the Historical Society (file 355). I also greatly appreciate the advice of Rabbi John Levi and Dr Helen Webberley in Melbourne, and Chaim Freedman in Israel. 1. Hyman A Simons, Forty Years a Chief Rabbi: The Life and Times of Solomon Hirschell (London: Robson, 1980); Raymond Apple, “Solomon Hirschel“, Rabbi Falk Memorial Lecture, Sydney, 2006. 2. Derek Taylor, Biography of Nathan Marcus Adler (in press, Vallentine Mitchell); Raymond Apple, “Nathan Marcus Adler: Chief Rabbi 1845-1890“, AJHS lecture, Sydney, 1973. 3. Prince Adolphus Frederick, Duke of Cambridge, was Elector of Hanover when Adler was rabbi there and was grateful for the Jewish community’s prayers when the Duchess was ill: JC, 12 April, 1889 – see Meir Persoff, Hats in the Ring: Choosing Britain’s Chief Rabbis from Adler to Sacks (Boston: Academic Studies Press, 2013, pp. 264-5. See also Roger Fulford, Royal Dukes: the father and uncles of Queen Victoria (London: Collins, 1973). 4. Raymond Apple, “Professor Marks and the Oral Law Controversy“, Jewish Studies conference lecture, Auckland, 2008. 5. The name should probably be spelled Holzel with an umlaut on the “o”. 7. Jewish Chronicle (JC), 11 October 1850. 8. Hermann Gollancz, ed., Biographical Sketches and Selected Verses by the Rev. Rabbi Samuel Marcus Gollancz (London: Oxford UP, 1930). 9. Israel Finestein, Anglo-Jewry in Changing Times (London: Vallentine Mitchell, 1999), pp. 56-57. 10. This is unlikely to be Yarmouth in England. Mina was probably born about 1821. AJHS archive file 355. 11. Jeremy I Pfeffer, “From One End of the Earth to the Other”: The London Beth Din, 1805-1835, and the Jewish Convicts Transported to Australia (Brighton: Sussex Academic Press, 2010), p. 297. 12. AJHS archive file 355. Adler letter to Sydney congregation. 13. AJHS archive file 355. Hoelzel letter to Sydney congregation. 14. AJHS archive file 355. 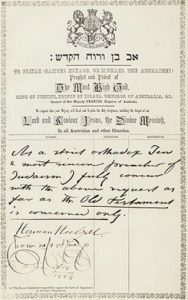 Hobart Hebrew congregation letter to Sydney, June 1853. 15. The JC report of the induction was reprinted in AJHS Journal, vol. 1, part 5, pp.146-7. 16. Adler was strict about the credentials of shoch’tim. See Taylor, “Biography of Adler”. 17. Peter & Ann Elias, eds., A Few From Afar: Jewish Lives in Tasmania from 1804 (Hobart: Hobart Heb. Cong., 2003), pp. 38-39; Max Gordon, Jews in Van Diemen’s Land (Melbourne: Ponsford, Newman & Benson, 1965). 18. Lazarus M Goldman, The Jews in Victoria in the Nineteenth Century (Melbourne: self-published, 1954), p. 114. 19. The lecture is reprinted in AJHS Journal, vol. 1 part 8, pp. 277-8. 20. AJHS file 355. Article by Michael Scalder, Australian Dictionary of Biography, vol. 4, p. 139. 21. Australian Jewish News, 7 November 1974. 22. Goldman, The Jews in Victoria, Index, sv “Rintel”; Judy Arndt & Joseph Aron, The Enduring Remnant: The First 150 Years of the Melbourne Hebrew Congregation 1841-1991 (Melbourne: Melbourne Univ. Press, 1992), Part 1. 23. This death certificate was located by genealogist, Chaim Freedman, and found on JewishGen. 24. Israel Porush, “Rev. Herman Hoelzel – The First Qualified Jewish Minister in Australia”, AJHS Journal, vol. 2 (1945), pp. 172-200; cf. vol. 1, pp. 146-147. 25. Bill Williams, The Making of Manchester Jewry (Manchester: Manchester U.P., 1976), passim; Raphael Loewe, “Solomon Marcus Schiller-Szinessy…”, Trans. JHSE vol. 25 (1962-7), pp. 148-189; P Selvin Goldberg, The Manchester Congregation of British Jews 1857-1957 (1957), ch.2; Taylor, “Biography of Adler”. 26. Adolph Schischa, “Hermann Adler: Yeshiva Bahur, Prague” in John M Shaftesley, ed., Remember the Days: Essays in Honour of Cecil Roth (London: JHSE, 1966), pp. 241-277; Raymond Apple, “Hermann Adler“, in AD Crown, ed., Noblesse Oblige: Essays in Honour of David Kessler OBE (London: Vallentine Mitchell, 1998), pp.127-138; Taylor, “Biography of Adler”. WordPress generated this page with 31 queries, in 0.267 seconds.